Mac became a complete food and wine geek in his early twenties. 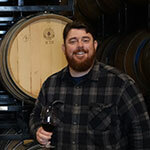 This led him to frequent sojourns to the Central Coast, where he became a quick study of the burgeoning wine scene. Mac’s first vintage was 2002. His enthusiasm for the local vineyards in Paso Robles and Santa Barbara County was matched only by the lure of the Rhone Valley. Mac’s own wines received overnight praise from the wine press-at-large. With a keen eye on the future of California vineyards and a respectful nod to the Old World, Mac continues to impress as one of the most progressive and even-handed winemakers on the Central Coast. Venus Lai first came to know Mac through his wine. On a trip to Paso Robles, Venus fell in love with Mac’s wines and immediately became a wine club member. When Venus learned of the opportunity to partner with Mac in expanding the property and growing the winery, she leapt at the chance. With a PhD in Molecular & Medical Genetics, Venus has successfully led cutting edge scientific research at two leading biotechnology companies - Regeneron and Amgen. She has always been passionate about the science and products of fermentation - wine, whiskey, beer, and sake. She even used to hold “Fermentation Parties” for her colleagues – little did she know that this would become the focus of her life! Adrian is a reformed micro-biologist. After submerging himself in a life of books and science, Adrian set out to understand the ‘hands-on’ side of the wine business. Adrian’s first stint with McPrice Myers was the harvest of 2010, and he assumed the role of Assistant Winemaker during the harvest of 2015. Liz has a background in science and logistics. She spent seven years working in the science education industry and decided to make a leap into the wine world, starting in wine fulfillment, and then tasting room management. Liz joined the team at McPrice Myers in the beginning of 2017, and in late 2017 became the Operations & Wine Club Manager. Malia fell in love with wine while living in the Russian River Valley in Sonoma County. With a background in Psych, Malia made a shift into the Paso Robles wine industry in 2015. After working at several boutique wineries in San Luis Obispo County, Malia started at McPrice Myers in 2018 as the Tasting Room Manager.